We describe a simple way of synthesizing the chitosan oligomer stabilized silver nanorods (AgNR) by polyol method in which polyethylene glycol (PEG 600) serves as both the reducing agent as well as solvent in presence of chitosan oligomer (O-Chit) under reflux condition at 180°C. The resulting AgNR were isolated and then characterized with Fourier Transform Infrared Spectroscopy (FT-IR), UV-visible spectroscopy (UV-Vis), Powder X-ray Diffraction Spectroscopy (PXRD), Field Emission Scanning Electron Microscopy (FE-SEM) and High Resolution Transmission Electron Microscopy (HR-TEM). 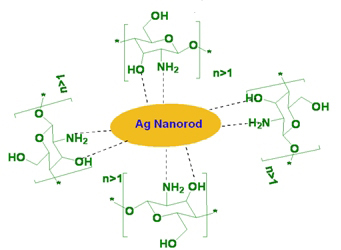 The electrochemical behavior of the chitosan oligomer stabilized silver nanorods modified glassy carbon electrode (O-Chit/AgNR/GCE) was investigated using a redox probe, K3Fe(CN)6. The electrocatalytic characteristics of (O-Chit/AgNR/GCE) were used for the electrochemical reduction of chlorophenol compounds like 2-chlorophenol (2-CP), 4-chlorophenol (4-CP) and 2, 6-dichlorophenol (2, 6-DCP) in presence of 0.1 M LiClO4 as supporting electrolyte. The influences of scan rate on rate of reduction of chlorophenols were investigated using Linear Sweep Voltammetry (LSV) experiments. From the electrochemical studies the electron transfer rate constant (ks) of reduction reaction was derived. The present system exhibits better electrocatalytic activity performances as compared to other electrodes.